Approximately 40 miles southwest of Portland, Oregon, travelers find Evergreen Aviation & Space Museum in the town of McMinnville. 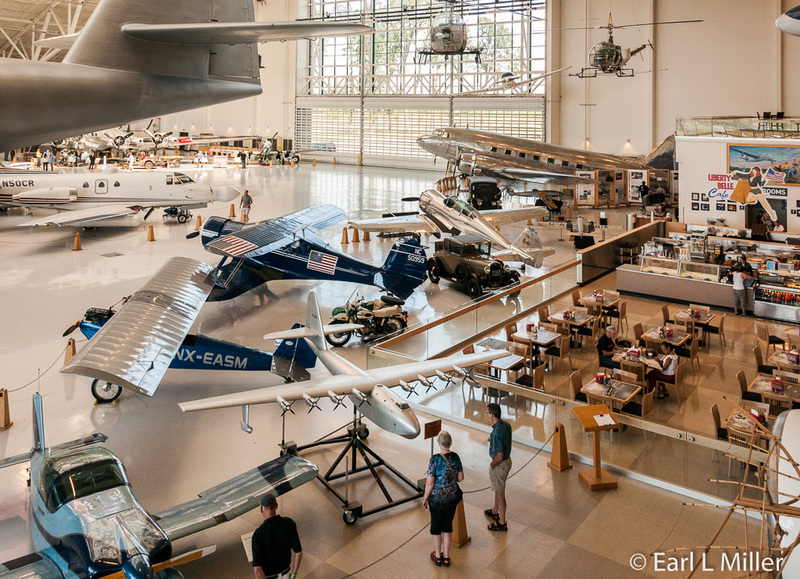 This aerospace museum is well worth the $25 admission as you'll find you’ll want to spend a full day there. Its centerpiece is the Howard Hughes' Spruce Goose, the largest flying boat ever built. From vintage to modern era planes, helicopters, the history of space exploration, even an indoor waterpark with interactive science exhibits, it’s first class throughout. In 1942, when German submarines were sinking hundreds of Allied ships, Henry Kaiser, steel magnate and shipbuilder, realized a need to move troops and material en masse across the Atlantic Ocean. He conceived the idea of a massive flying transport and spoke to several manufacturers. All said “No” to him until he contacted Howard Hughes to design and build it. The government made the task more challenging by not allowing the use of steel and aluminum. The project was originally called HK-1 for the first aircraft built by Hughes-Kaiser. When Kaiser withdrew in 1944, Hughes continued on his own renaming the project H-4, the Flying Boat. The original contract to build three planes was rescinded when Kaiser left. The new government contract limited production to one aircraft. It was not completed until well after World War II was over. The Spruce Goose, six times larger than any aircraft of its time, was made almost entirely of birch. 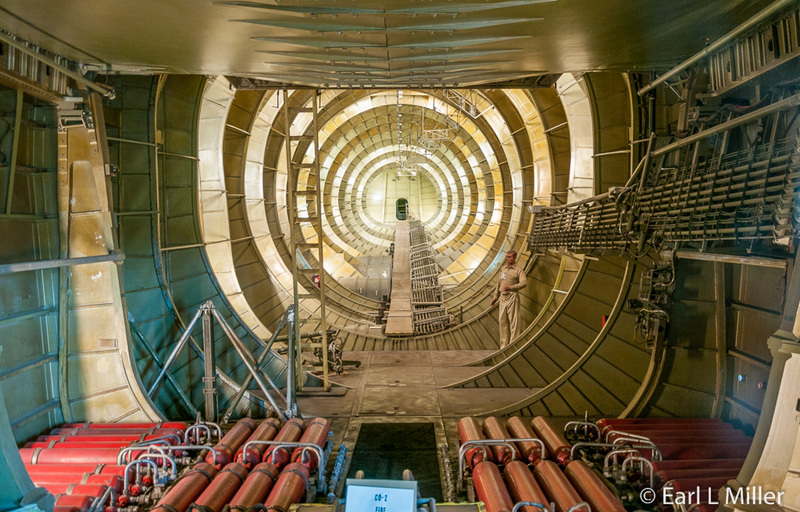 It employed the plywood-and-resin “Duramold” process where the wood was glued together in nine layers in the skin of the airplane, for example, or 150 layers in the wing spar. Nails were used to hold the pieces of the aircraft together until the glue set. At the end, thousands of nails were pulled. The project was contracted for $18 million while Hughes contributed an additional $9 million of his own funds. Hughes testified during a Senate hearing on the Spruce Goose on August 6, 1947. He had been accused of defrauding the government. During a break in the hearings, Hughes returned to California to run taxi tests on the H-4. On November 2, 1947, thirty-six were on board which included, besides the crew, guests, the press corp, and seven other industry representatives. Four reporters left after the two test runs, but the remaining press stayed on board. They got the real story when after picking up speed on the channel facing Cabrillo Beach, the Flying Boat lifted off. It remained airborne for one minute at 70 feet off the water for around a mile. It was the Flying Boat’s only flight. Until Hughes’ death in 1976, a crew maintained the aircraft in flying condition in a climate-controlled hangar. That year Hughes’ Summa Corporation gifted the plane to the Aero Club of Southern California. The Aero Club leased it to the Wrather Corporation. It was kept in a large dome next to the Queen Mary exhibit in Long Beach, California, The Walt Disney Company acquired the Wrather Corporation, taking over the Spruce Goose lease in 1988, but didn’t find the plane in their future plans. In 1992, Evergreen bought the airplane from Aero Club. Beginning that year, the Spruce Goose was disassembled then transported by a large barge up the West Coast then down the Columbia River to Portland, Oregon. It remained there for several months until the Willamette River’s water levels allowed for the massive structure to pass under its many bridges on several smaller barges. In February, 1993, it made its final 7.5 mile journey to McMinnville by truck. Volunteers reconstructed the plane in temporary hangars. 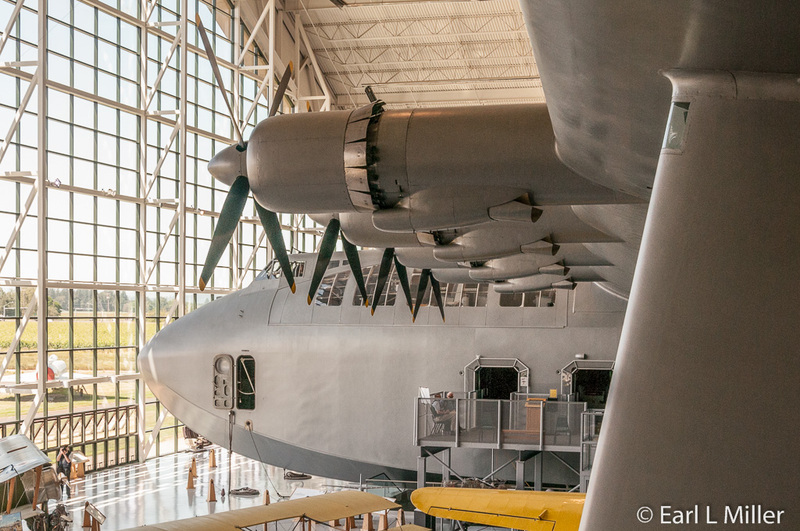 In 2001, they completed their work and moved the Spruce Goose into its present home at Evergreen Aviation & Space Museum. 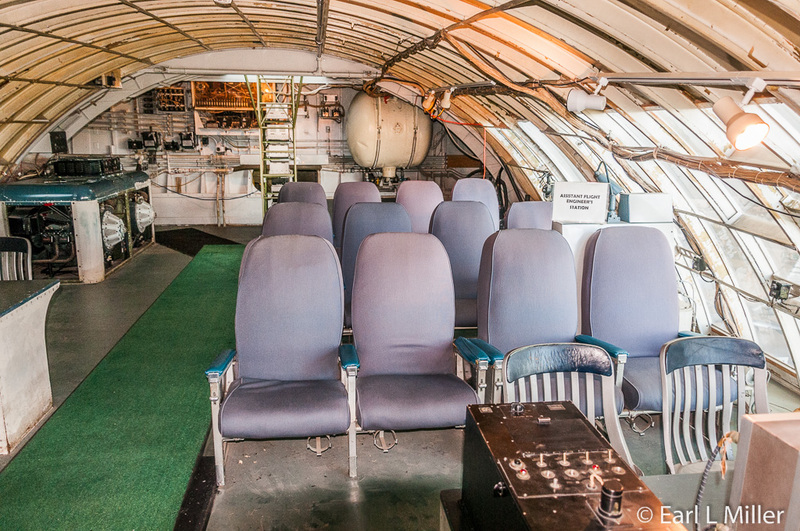 Visitors who pay a regular admission are allowed to enter the Spruce Goose fuselage. There are two packages to get a closer look. A group of four can have a 15-minute visit and photo of themselves in the cockpit for $25. For $50 a person, the tour lasts 45-50 minutes and includes the photo. Beware there is a narrow spiral staircase to reach the cockpit so that area is not handicapped accessible. 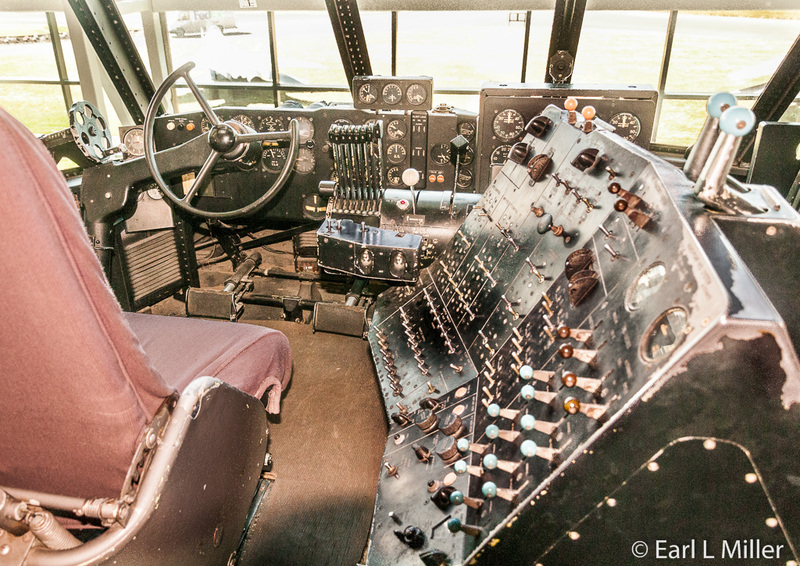 Larry Wood, the museum’s executive director, gave Earl a personal tour of the cockpit. I looked at the staircase and went “No Way.” I stayed back and watched a very comprehensive slide show of the plane and admired the various objects in the display case. These include a log book of the first official flight, a hand held receiver from the flight deck, and a beach ball. Hughes was afraid the plane might sink and ordered void places in the hull and wing floats filled with inflated rubber bladders and beach balls. Outside the plane, be sure to watch the video on its history. You can purchase the video from one of the gift shops. 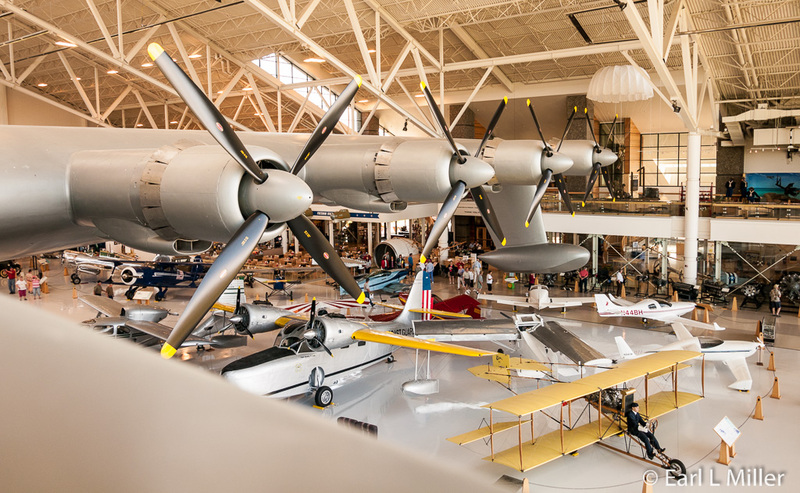 This 120,000 square foot building houses not only the Spruce Goose but planes from the early days of aviation to the Korean War era. You’ll also find home built planes. The museum deserves much applause for its signage. For each plane displayed, a summary is given on the type of aircraft and the history of that particular plane. The museum has 135 aircraft located in this, their Space Museum building, outside this complex, and across the street. Some they own while others are on loan from such places as the Smithsonian, Army, Navy, and Marine Museums. 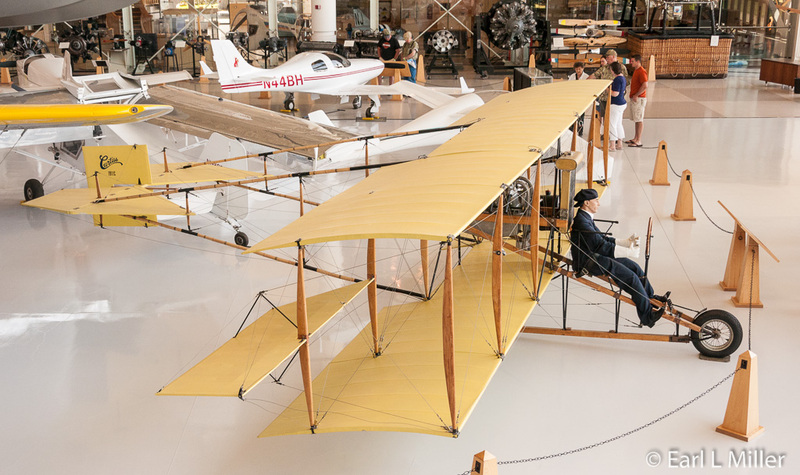 You’ll spot a replica of the Wright Brothers 1903 Flyer. The actual Flyer took flight at Kitty Hawk on December 17, 1903 with Orville Wright at the controls. It was a 12-second hop of 120 feet. The Flyer made three more flights that day. The plane didn’t last long. Parked in the sand, a sudden gust of wind caught it, and smashed it beyond repair. This replica was built by Century Aviation in Wenatchee, Washington. It was built from copies of plans made in 1985 by the National Air & Space Museum. The Curtiss Model 51 Fledgling dates to 1927. It was a trainer to meet the U.S. Navy requirement to teach “fledgling” aviators the basics of flight. Over 50 were built. Curtiss also developed a commercial version of this in 1929. Most of the 109 constructed served with Curtiss’ own air taxi service. 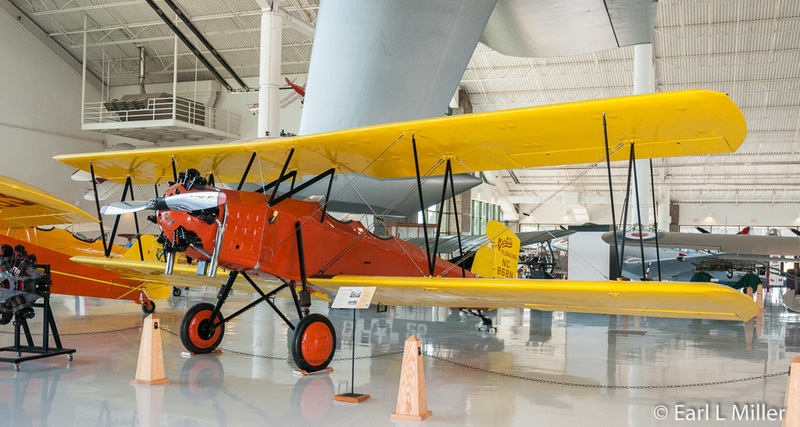 The museum’s plane was the 51st built and served its early years in St. Louis. The Douglas DC-3A was first flown in airline service in 1936. Many of these planes still fly today. 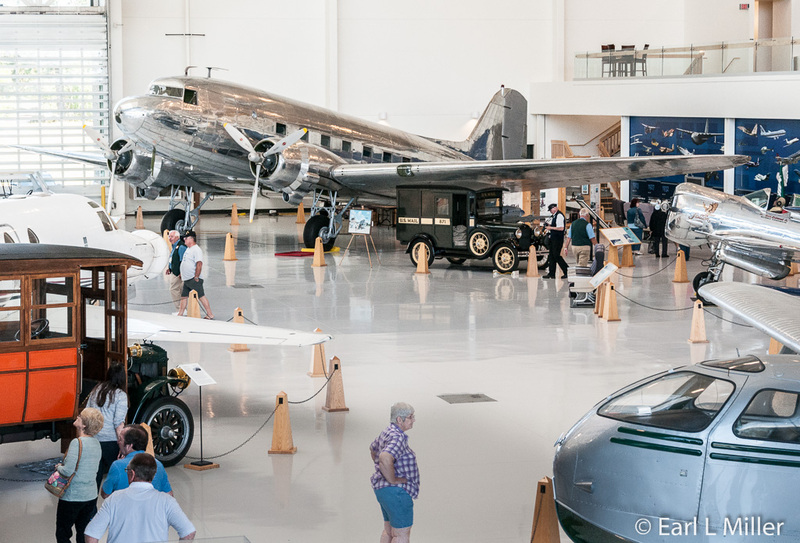 The museum’s plane is the second oldest surviving DC-3. Delivered to United Airlines in 1936 and briefly leased to Eastern Airlines, it was the first to be fitted with Pratt & Whitney supercharged engines. It has flown more than 15 million passenger air miles. That’s equivalent to 30-round trips between the earth and the moon. The DC-3 was renamed the Douglas C-47A Skytrain and put to use in World War II where soldiers called it “Gooney Birds.” This version of the DC-3 had improved engines, cargo doors big enough to admit a jeep, a strengthened rear fuselage, and a floor that could hold lots of equipment. They served in every theater of the war. During the Viet Nam War they were modified to serve as gunships. Evergreen’s plane took part in D-Day, flying three missions to drop paratroopers and tow gliders. Eventually, it was part of the West Coast Airlines fleet. The North American SNJ-4 is nicknamed the Texan. 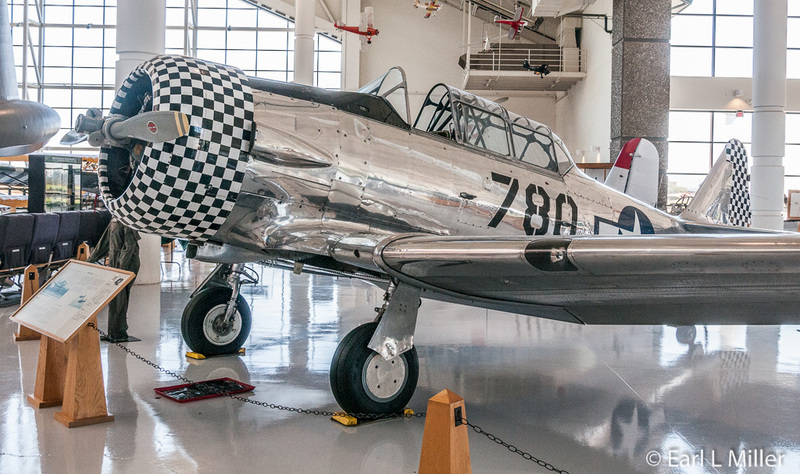 It was an advanced trainer in World War II, designated T-6 by the U.S. Army and the SNJ by the Navy. Student pilots graduated from these to Mustangs and Corsairs. After the war, Texans served at least 55 nations in the roles of trainer, fighter, bomber, attack, observation, and transport aircraft. This one served the Navy from1943 to 1956. Its airframe was altered for weather modification flights during the 1960's before being restored to its original configuration. The Lockheed P-38L Lightning was twice the size and power of any U.S. fighter when it flew in 1939. In the Pacific, P-38s ambushed Japanese Admiral Yamamoto’s plane. He was the architect of Pearl Harbor. Take time to view the video, at the museum, on the raid, located near this plane. Major Richard Bong, America’s highest ace, destroyed 40 Japanese planes with a Lightning. This particular plane, restored by the museum, is now considered one of the finest examples of the Lockheed P-38. Boeing’s B-17G, the Flying Fortress, had a long range capability demonstrated on many flights in the 1930's. At the time of Pearl Harbor, only 155 existed. However, by May 1945, more than 12,700 had been built. They were used in daylight precision attacks on enemy strategic industries. They performed in every theater but were most famous for the Eighth Air Force daylight bombing raids over Germany. Many sustained incredible damage, due to anti-aircraft fire and German fighters, but still brought their crews home. The one on display was used by the government in clandestine operations and then to develop the Fulton “Skyhook” which retrieved men or equipment from the ground without landing. It demonstrated this technique in the James Bond movie “Thunderball.” Evergreen Aviation used it as an aerial fire bomber before returning it to its wartime configuration in 1990. The Learjet 24 is well known as the world’s best selling, personal luxury/executive, travel jet. It was designed by the Swiss in the 1950s to be a fighter plane but never produced. American inventor, William Lear, who invented the car radio and 8-track tapes, purchased the tooling from the Swiss. He founded a company in Wichita Kansas and created the world’s first business jet. 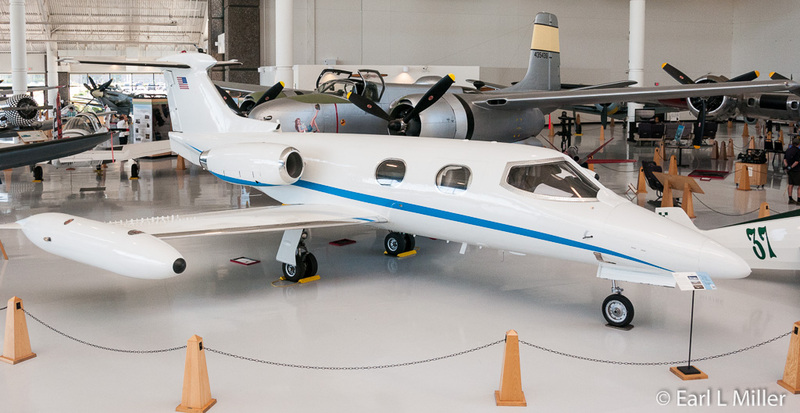 The museum’s plane is painted to resemble an aircraft serving NASA at the Dryden Flight Research Center. The Republic F-84F Thunderstreak was used during the Korean War. It was a high speed fighter and the first single-seat aircraft capable of carrying a nuclear weapon. One version was used for photo reconnaissance. The Thunderstreak on display was used by an Iowa aviation tech school before being restored by the museum. Go upstairs to the mezzanine to get a bird’s-eye view of the entire floor. You’ll find more exhibits here. 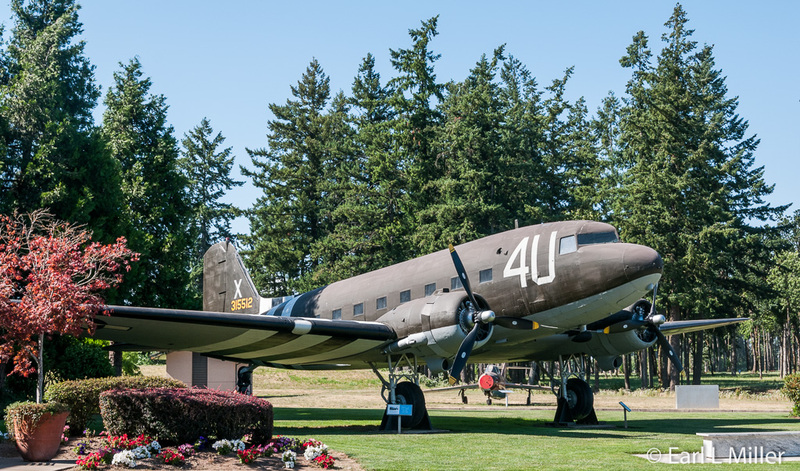 One is dedicated to the accomplishments and life of Captain Michael King Smith, who with his father, Delford F. Smith, CEO of Evergreen International Aviation, founded the museum. Their mission was to honor veterans, educate today’s youth, and preserve aviation artifacts with dignity. After graduating from the University of Washington, Michael received a commission in the U.S. Air Force as a Second Lieutenant. He earned many awards and made valuable contributions to the field of aviation in Oregon. An outstanding pilot, he flew lead in his McDonnell Douglas F-15A Eagle fighter plane for the 123rd Fighter Squadron with the Oregon Air National Guard. Sadly, he was killed in an automobile accident in1995. 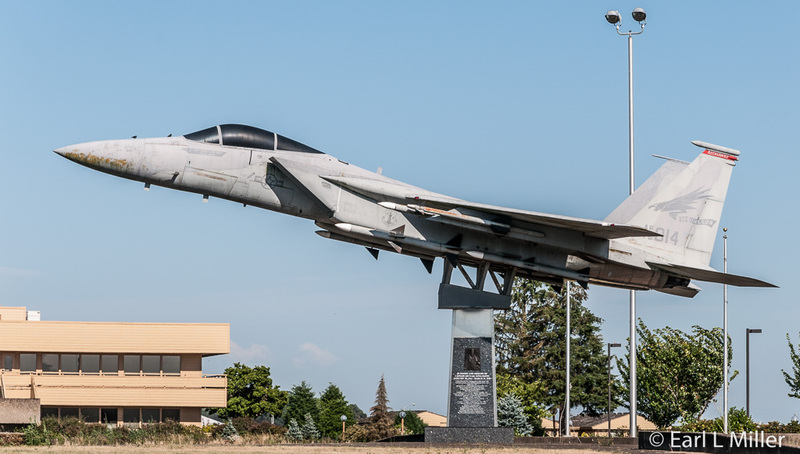 An F-15 can be spotted across the road from the Evergreen Museum. It stands as a memorial to Michael and Major Rhory Roger Draeger who was killed in the same automobile accident. This plane was delivered to the Air Force in 1977. Flying for Israel, Saudi Arabia, Japan, and the U.S. Air Force, F-15s have destroyed 104 enemy aircraft and never lost a dogfight. It’s armed with missiles and guns. 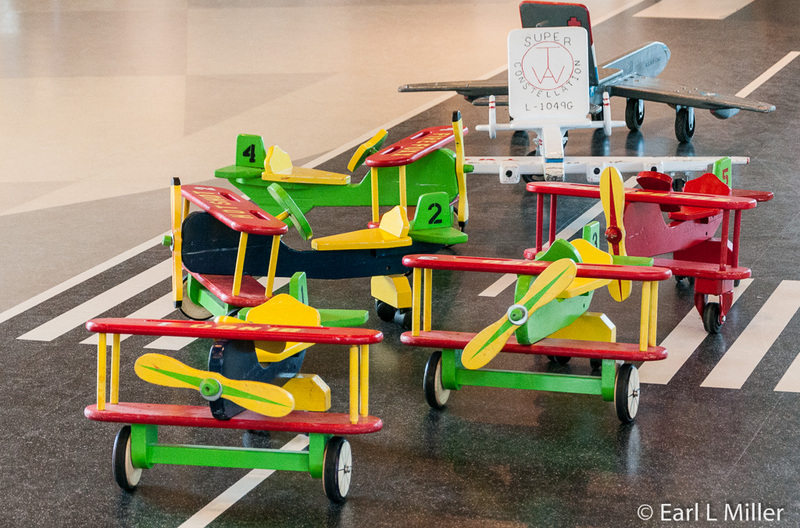 Before exiting the building, note the toy planes and helicopters children can climb on. Sometimes a miniature Spruce Goose is in the area. Outside the space building is a playground. The other aeronautical building devotes itself to aircraft since the Korean War including many that are homemade. It’s where you’ll find a variety of helicopters; the Engineering Aerospace and Science Academy; and extensive information and displays on the United States, Russian, and German space programs. Education is regarded highly at this museum. In conjunction with McMinnville High School, those who take all the Academy’s math, science, engineering, engineering projects, and surveying courses, then pass the advance placement tests, can skip a year in an engineering school. The space exhibits include the space history from Goddard’s rockets through the international space program via videos, wallboards, original artifacts, and replicas. Among the subjects covered are Yori Gagarin’s flight and Sputnik as well as Alan Shephard on Freedom 7. A Titan II is on display in a launch position. 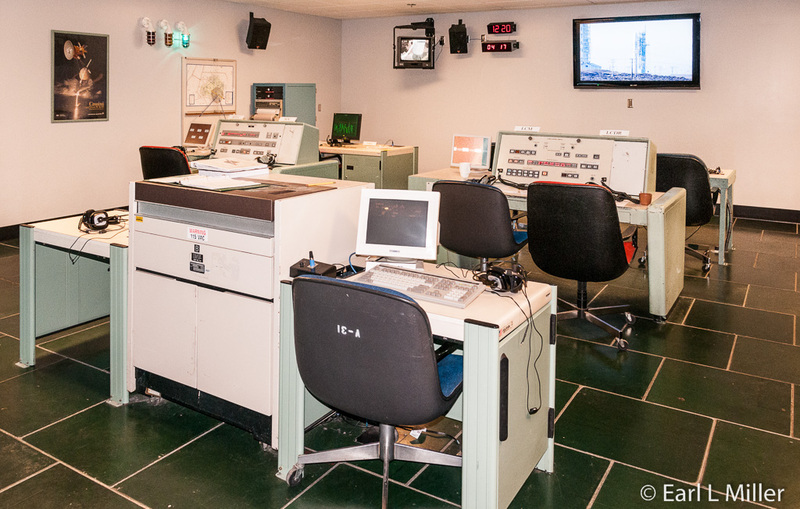 Take an elevator two stories down and you can experience a replica of the control room for Titan II launches at California’s Vandenburg Air Force Base. You can even watch one of its last launches on October 17, 2003. Return to the floor and look up to see a model of Ed White suspended from a Gemini space capsule. At “Rendezvous in Space” you can sit in a space stimulator and dock a space capsule. An Atlas Verner engine is on display, the type that powered John Glenn’s craft. The museum also houses the Apollo capsule used in the movie “Apollo 13" and an actual engine from Apollo 11 (a J-2 rocket engine of the type used in an Apollo Saturn V launch rocket). You’ll also see a Titan 4 without its solid booster rockets. You’ll find one of those in the back parking lot. You’ll also find a Cessna 206 and a Hughes 500D helicopter used by Evergreen Helicopters and the World Health Organization to eradicate the black fly. One million Africans had lost their sight by river blindness caused by the larva of this fly. These two aircraft worked in the program that drastically reduced the effects of this illness. 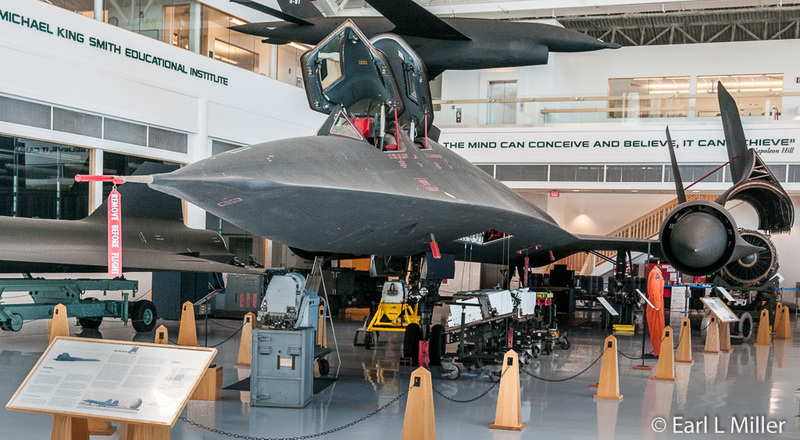 Drawing a lot of attention at the museum is the Lockheed SR-71A Blackbird. It flew higher and faster than any other airplane. It has an altitude record of 85,069 feet and a speed record at 2,193 mph; both on the same day. It flies at Mach 3 and goes seven miles in twelve seconds. To deal with the high temperatures generated by such high speeds, the aircraft structure and skin are composed of titanium. The Blackbirds entered service with the Air Force in 1966 and were used in reconnaissance over Viet Nam but not China or Russia. They were retired in 1989 but brought out of retirement for five years because of world tensions. NASA used SR-71s for high speed research until retiring them in 1999. The museum’s is one of the three that was used by NASA. 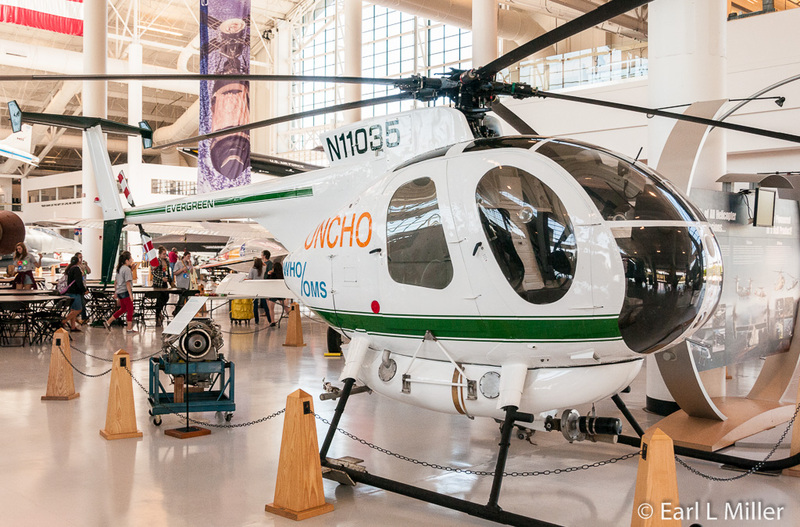 The museum’s helicopter section is composed of Bells, Hillers, Hughes, Sikorskys, a Kaman, and more. The Bell HTL-3 saw combat in Korea with the Marines. Of the 12 built, the museum’s is the only one known to exist in North America. The Kaman SH-2F Seasprite was assigned to the Navy. Starting in 1962, they performed many search and rescue missions for downed aviators in Vietnam. They remained in service until 1993. The museum’s Seasprite is on loan from the National Museum of Naval Aviation. The Sikorsky H-19D Chickasaw had a large payload capacity. Its engine was located in its nose, and pilots sat up high to make room for more passengers and cargo. Entering operations in 1950, it proved valuable for search and rescue and medical evacuations as it could move ten troops. It was used by all of the U.S. armed forces and 35 other nations. The Sikorsky UH-34D Seahorse was first created for the Navy then went into all branches of the U.S. military. The Marines used it in Viet Nam as its reliability exceeded other helicopters and it could absorb lots of combat damage. In 1968, some of these aircraft were turned over to the South Vietnamese Air Force. The museum discovered this aircraft was one of those during the helicopter’s reconstruction. On the front of the Space Museum is a plane that must be seen. It’s an Air Force II, a McDonnell Douglas VC-9C. It served the Vice Presidents of Ford, Carter, both Bushes, Reagan, Clinton, and Obama. It was based at Andrews Air Force Base and later Scott Air Force Base. The theater is located between the two main buildings. Included in the admission fee is the opportunity to view one of the three films. The screen is 53 feet tall and 70 feet wide. We viewed “Living in the Age of Airplanes” about how once the world was isolated but that products and people now travel quickly due to airplanes. Downstairs in the theater building is the Oregon Aviation Hall of Honor. To be a nominee, an individual must be a native or resident of Oregon who has achieved excellence and historic achievement in one or more fields of aviation. Induction takes place annually. 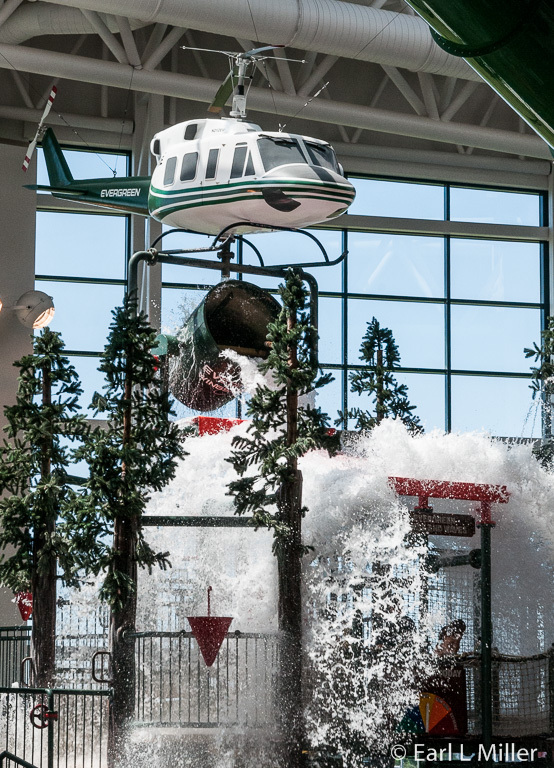 You can recognize this indoor 70,000 square foot waterpark by the 747 aircraft sitting on top of its roof. You climb six stories up to the plane then descend through four big water slides, over the roof, into the water below. Under a helicopter that dumps 300 gallons of water, visitors find three slide structures. 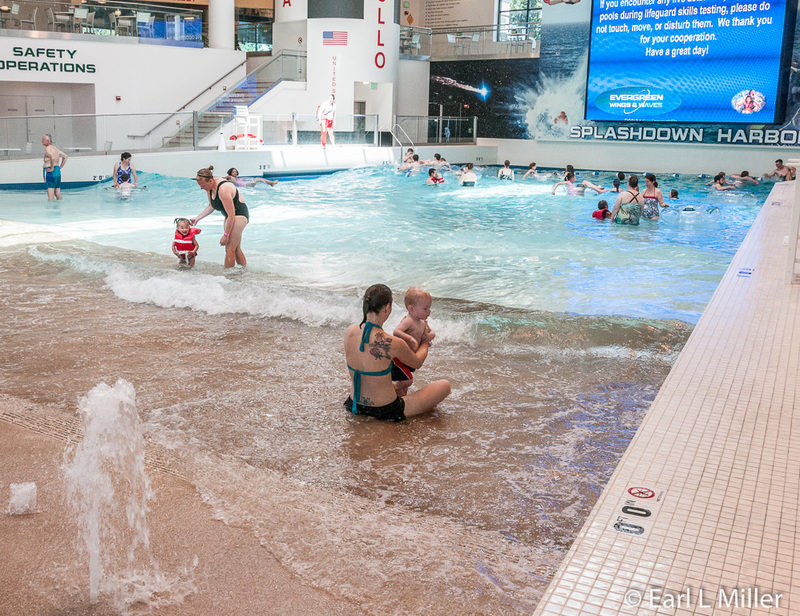 A large wave pool holds more than 91,000 gallons of water. A special toddler area contains bubbles, fountains, and two slides. Upstairs is a science center with interactive exhibits. The waterpark also has a gaming center, gift shop, and café. Admission is separate from the museum. It’s $32 for those 42 inches or taller and $28 for those under 42 inches. You will find cafes and gift shops in the Aviation and Space Museum buildings and a snack bar at the theater. Places to sit are plentiful throughout the museum buildings. Look for the first class airline passenger seats. Admission is $25 for adults, $24 for seniors, and $23 for youth. Your AAA card provides $4 off admission for up to four people. Hours are 9:00 a.m. to 5:00 p.m. daily. Evergreen Aviation & Space Museum’s address is 500 Northeast Captain Michael King Smith Way in McMinnville. Their telephone number is (503) 434-4180 and their web site is evergreenmuseum.org.